There are a number of market trends shaping the life sciences industry. Global population and life expectancies are increasing. Globalization of markets, especially the growing pool of middle class consumers in emerging economies, provides an increasing revenue base for large life sciences companies, but also creates the challenge of dealing with multiple global regulatory standards. It also facilitates strong local competition, which can increase price and margin pressures. Globalization creates the need for distributed operations that require an ecosystem approach in place of the traditional supply chain. This also creates possible issues of data integrity. At the same time, pressures to lower costs have never been greater, with growing competition from generic drug manufacturers, patent cliffs and pressures from bulk buyers. This is why innovation in manufacturing technology has never been more important and in greater demand than right now. Life sciences companies seek continuous process manufacturing solutions to improve product quality and reduce costs, as well as solutions for batch and single-use equipment in bio-technology based processes. Globalization continues to affect the Life Sciences industry. While demand for medications is rising in emerging economies, cost pressures from new competitors and healthcare payers in traditional markets are dampening economic prospects of life sciences companies. However, with new, innovative R & D and production processes, an increase of new life sciences products can be expected in the future. In 2016, the FDA received 36 new molecular entity NDAs – higher than any year over the past decade. ARC is seeing new production plants being built globally to accommodate new medicines, vaccines, and drugs for cancer, osteoporosis, MS, hepatitis, Alzheimer, etc. Mergers and acquisitions, particularly of startups, enables larger life sciences companies to leverage new research activities, take advantage of tax-advantaged geographies, and capture new and innovative portfolios. ARC continues to see “Big Pharma” outsourcing trends as companies selectively outsource manufacturing to contract manufacturers, rather than invest in costly new production facilities. This arrangement enables branded companies to focus more on core competencies in R&D and marketing, letting their contract manufacturing partners make the needed investments in production assets and validation. However, this strategy increases challenges relative to intellectual property protection. As a result, many companies are also starting to build production capacity and new plants. Even the US is starting to see new life sciences plants being constructed after a long hiatus. Manufacturers of branded products are operating under tighter margins due to competition from generics, pressure to reduce costs, and higher regulatory burdens. While this is a business challenge, it will also drive capex in automation technology as companies invest in technologies to improve efficiencies, reduce time-to-market, ensure quality, and reduce costs. Life sciences manufacturers continue to increase use of modular production systems and disposable manufacturing, particularly for fast track products. Modularization provides the ability to quickly scale up the production of a new drug by creating multiple parallel production lines, allowing drug makers to ramp up production lines in numbers but not in size. Life Sciences companies are investing in the technologies and infrastructure necessary to achieve and demonstrate compliance with current and future global regulatory requirements, such as the US FDA’s Continued Process Verification (CPV), 21CFR part 11 and data integrity. ARC sees increased activity in pharmacogenomics, the study of a person’s response to drug therapy, and the use of personalized medicine. Pharmacogenomics advances drive demand for individual medicines, and mass customization of personalized medicine results in more variations in product recipes. In-creasing efficiencies, reducing costs and maintaining product quality will lead to an increase in automation expenditures. Track and trace continues to be an important global driver of investment in the life sciences industry, which is expected to continue over the next few years to address counterfeit prescription drugs, global compliance, and confirmation of end-to-end data integrity. Companies are implementing track and trace solutions to meet increasing regulations, safety concerns and legal challenges. The industry is becoming more competitive, even in the biotech industry, where biosimilars have come of age. The prognosis for the Life Sciences industry is better than for many others thanks to two megatrends: increases in global population and life expectancies. The growing pool of middle class consumers in emerging economies who want and can now afford better healthcare, as well as increasing government health care coverage in some of those countries, is playing an important role in driving this demand. Innovative approaches to assess pharmaceutical value and ROI are more important than ever for the Life Sciences industry. R & D innovation and the ability to scale up processes for production quickly to minimize time to market and maximize competitive advantages is vital. Legacy systems and equipment are in need of updates and replacements with solutions that ad-here to open communication standards to ensure interoperability and interconnectivity of all manufacturing assets to the rest of the enterprise. 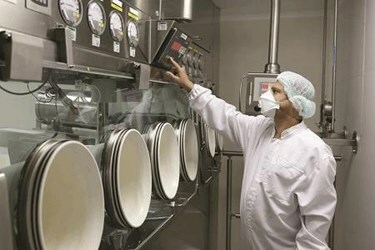 The Life Sciences industry’s primary manufacturing concerns include improving productivity and reducing costs, the ability to document and secure everything from raw materials to process changes and software version control, and serialization and track and trace capabilities to meet local regulations while ensuring the highest levels of security. The ability to move from batch processes to continuous processes, particularly for bulk pharmaceuticals, is critical, especially with the use of disposable and modular production increasing. As with all industries in a connected world, cybersecurity continues to be a significant issue and an area that requires further investments. The increasing complexity of life sciences manufacturing processes creates a growing demand for standardized applications for MES, batch, recipe management, and scheduling. Process and business visibility are becoming more significant, and integration to ERP, along with IT/OT convergence, is vital to operations. In order to address this “wish list”, advanced analytics need to be deployed as an integrated systems component to reduce costs and improve productivity, in both the manufacturing process as well as how raw materials are managed. Predictive maintenance and analytics need to be used to help prevent unscheduled downtime, which is one of every manufacturers’ biggest issues. The industry needs better visibility and increased deployment of mobile devices for HMI, further leveraging wireless solutions, such as tablets and smart phones, where regulations allow. The objective of manufacturers in the Life Sciences industry is to bring the benefits of smart manufacturing and digital transformation to all people, assets and processes involved in the manufacturing ecosystem. This means bringing the “smart” concept to plant assets & equipment, energy management, and continuous and batch processes, as well as to the plant operators and the asset & equipment suppliers and distributors. Smart means real-time performance management solutions that improve efficiency and asset utilization while maintaining product quality. It also means digitalizing quality and production process while providing end-to-end traceability to ensure product integrity. In addition, it means providing energy management that improves energy efficiency for cost effectiveness, sustainability and safety. Finally, it means implementing an automation integration layer that reduces time-to-value and risk through standardizing automation and recipe management across the manufacturing network. To address these industry trends, market drivers and challenges, the Life Sciences industry is demanding its suppliers develop smart manufacturing solutions that focus on key value propositions, such as improving manufacturing agility, optimizing end-to-end drug manufacturing costs, and digitalizing validation practices, compliance management and production operations. Life Sciences Serialization, which focus on harmonization between legacy production applications, such as MES and Quality systems, providing track, trace and reporting solutions for a line, site, or the enterprise. It is a software solution designed to comply with GS1 standards for the serialization process. Line Performance, which is a turnkey OEE (Overall Equipment Effectiveness) and monitoring package. It is designed to provide information to help users achieve maximum performance and meet or exceed operational Key Performance Indicators. Automation Integration Layer (AIL), which takes on a unique template library approach that helps life sciences companies encapsulate standards and best practices. It builds towards manufacturing operations standardization efforts and can integrate with current infrastructure, as well as meet future expansion needs. EcoStruxure builds on interoperable, cloud-connected and/or on-site technologies organized around providing and securing edge control. Many life sciences plants have mission-critical applications. They need operations to run, even if the networks suffer an interruption or if the software/analytics running in the Cloud stops working. Outages are not acceptable. Controls must be capable of working locally with autonomy. Operators must be able to take over the operations if a problem should arise. EcoStruxure’s edge control layer enables these capabilities, enhancing Schneider Electric’s position of innovating the digital value chain within the Life Sciences industry. Another benefit of smart manufacturing that is driving today’s digital transformation is the ability to deliver workflow software solutions that, for example, enable a model-driven MES, enforce production rules and manufacturing procedures, enhance knowledge management, and drive collaboration across the workforce. For life sciences, workflow software functionality adds closed-loop work process management, along with escalation and system-of-record capture of processes, procedures and activities. Schneider Electric’s workflow software is an advanced application that enables life sciences companies to digitalize manual and automated processes that include people, processes, equipment and/or systems. Based on a Business Process Management (BPM) foundation, Schneider Electric work-flow software enables life sciences companies to model, execute, analyze and improve processes inside and outside of their organization to drive higher levels of collaboration, productivity and innovation. All Life Science manufacturers know they must comply with good manufacturing practices (GMP), a system defined by global food and drug authorities for ensuring pharmaceutical products are consistently produced and controlled according to quality standards. Many life sciences manufacturers are also very familiar with GAMP, or good automated manufacturing practice, guidelines manufacturers and users of automated systems in the life sciences industry must adhere to. The ISPE's GAMP guide for validation of automated systems in manufacturing specifies guidance and approaches to ensure manufactured products adhere to strict quality standards. GAMPs areas of guidance coverage ranges from raw materials, plant assets, and facilities to training and staff hygiene. One rule of GAMP, for example, is that quality must be built into each stage of the manufacturing process, not just tested into a batch of product. GAMP5, or version five, which was released in 2008, covers topics, such as lifecycle approaches, quality risk management, and QMS or quality management systems. Schneider Electric Life Sciences solutions are designed to help users define, design and develop systems for GAMP5 compliance. They bring a compliance mindset into the early design phase to reduce the cost of validation for the manufacturer. The solutions adapt the traditional GAMP5 V-Model with the ASTM E-2500 standard guide for specification, design, and verification of pharmaceutical and biopharmaceutical manufacturing systems and equipment, providing a true risk-based model leveraging all testing, and a delivery model to facilitate faster and lower cost global rollouts. Tracking and tracing in life sciences requires that all items have application identifiers defined based on Global Standards 1, or GS1. This is the organization that develops and maintains global standards for application identifiers or symbols printed on products that can be scanned electronically, such as barcodes. These application identifiers can be add-ed and modified when a new standard is introduced. For every product, depending which country the product is being sold to, information of the application identifier can be defined at each aggregation/package level to ensure the serial number and details printing fulfill the country’s mandate. Schneider Electric’s serialization solution adheres to GS1 standards, providing aggregation at each point in the packaging hierarchy and serialization with or without aggregation. The software enables a full aggregation relationship, and provides the flexibility to set between the Global Trade Item Number, or GTIN, and the Serial Shipping Container Code, or SSCC. The solution enables out-of-the-box MES integration and enables tracking and tracing functionality end-to-end, from manufacturing to the supply chain. Life Sciences manufacturers constantly seek to increase manufacturing operational agility and improve time to market. The challenge is to do so while lowering costs. To that end, greater focus on managing line performance is a viable strategy that can maximize return on existing investment. Line performance can be improved in 3 ways: 1) increase equipment up-time, 2) increase line throughput, and 3) increase product quality. Schneider Electric’s Line Performance solution provides manufacturers production delay analysis with reasons and root cause analysis to meet these three objectives. Dashboards and analytics reports on performance evaluation cover all production, quality and maintenance aspects of lines management. A comprehensive work order execution platform with the entire plant’s work orders, including individual machine’s work order progresses and queues, provide a holistic overview, allowing greater overall efficiency and management in the manufacturing plant. As with all other manufacturing plants, repeatable quality across efficient batch executions is highly desired in the Life Sciences manufacturing industry. Recipe and Batch management solutions work as an “intelligent agent”, allocating equipment, downloading parameters and automating recipe procedures in the most efficient operations possible. The solution abstracts recipes from underlying control systems, which helps to standardize new product introduction processes and procedures enterprise-wide. In most cases, extracting operational data between various systems does not typically require a “rip and replace” of existing systems. This data can be readily unified within an additional layer to provide significant time and monetary savings. The Automation Integration Layer solution takes on a template library approach that includes an embedded validation package and integrated workflow tool. It helps drive standardization across the manufacturing network while reducing risk. Globalization of markets, increasing price and margin pressures, multiple global regulatory compliance challenges, cost pressure and growing com-petition from generic drug manufacturers are now driving innovation and investment in life sciences manufacturing technologies. Life sciences companies seek solutions to improve product quality and reduce costs. These trends have led Schneider Electric to further supplement their broad portfolio of smart manufacturing life sciences industry solutions to help the life sciences industry digitalize their operations to reduce time-to-value, improve efficiency and asset utilization, and do so while ensuring product integrity, regulatory compliance and safety requirements are met. Smart manufacturing enables the implementation of information-enabled operations that offer virtually infinite potential to improve business performance. Life Sciences companies can use data that has long been stranded inside machines and processes to identify production inefficiencies, com-pare product quality against manufacturing conditions, and pinpoint potential safety, production, or environmental issues. Remote access connectivity and mobile technologies can immediately connect operators with off-site experts to avoid or more quickly troubleshoot and resolve down-time events. Schneider Electric’s Life Sciences industry solutions include Serialization, Line Performance, and an Automation Integration Layer, addressing good automated manufacturing practices, serialization, and track and trace initiatives. With these solutions, customers can implement smart manufacturing strategies to enable digital transformation. What can result is real-time performance management, digitalized quality, traceability and energy management, as well as better people, process and automation integration across the enterprise. For further information or to provide feedback on this article, please contact your account manager or the author at cresnick@arcweb.com. ARC Views are published and copyrighted by ARC Advisory Group. The information is proprietary to ARC and no part of it may be reproduced without prior permission from ARC.